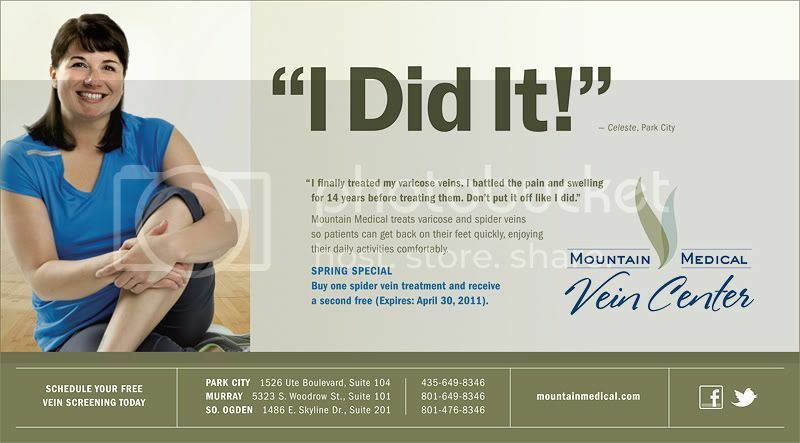 How does one advertise for the treatment of Varicose veins. It takes a team! Scott Eggers was the art director/ graphic designer. He is extremely talented and experienced in advertising. Penny Goodwin was also incredibly awesome with wardrobe / makeup. Mountain Medical Physician Specialists is the largest radiology and vascular surgery practice in Utah, serving more than 15 locations, including local hospitals and private clinics. We offer multiple areas of subspecialty expertise through cutting-edge diagnostic imaging, interventional radiology, vascular care and surgery. The people in these ads are real folks who are affected by varicose veins. It was an interesting experiencing learning more about the process and the demographic that needs help. Both of the woman spend time on their feet all day. Which seems to be one of the triggers. Women develop varicose veins nearly four times as often as men. In fact, about 70% of adult women get varicose veins at some time in their lives. Some women are at greater risk due to heredity. 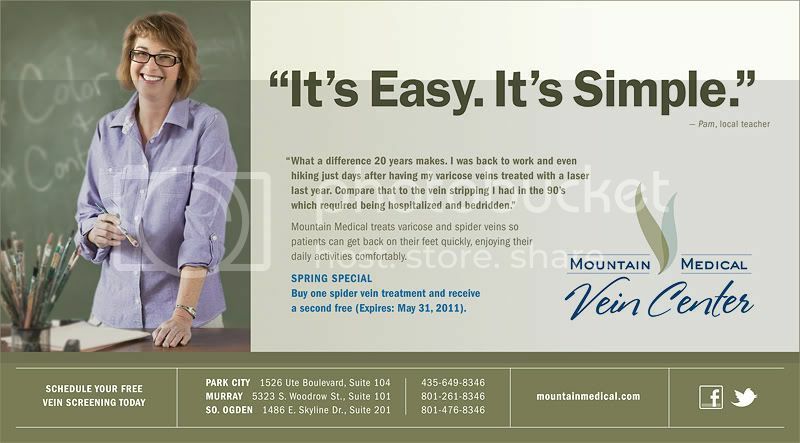 Others are likely to get spider veins because of lifestyle. Women who are pregnant or use oral contraceptives are at risk for varicose veins. So are women who experience an increase in estrogen, which is believed to weaken vein walls. Overweight women often get spider veins because they’re more likely to develop circulatory problems, diabetes or heart disease. All of these conditions hinder bloodflow to the heart. Standing for long periods of time also increases the risk of getting spider veins. That’s because it’s harder for veins to fight gravity and return blood to the heart. Those who wear high-heeled shoes can stress leg veins by forcing their calf muscles to contract more than usual.